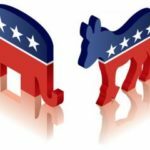 Over the past several years, the Democratic and Republican parties have drastically realigned. The Democrats increasingly represent higher income, college educated, coastal voters. As such, how can they realistically advocate for tax increases? Similarly, the Republican party increasingly represents older, blue-collar, and less educated voters. With this sort of base, how can they call for reducing entitlements? It’s as if leadership is wholly unaware of the new constituents they represent.